I’ve been waiting to write another wine review until I could discover another great one like the Saint Francis Old Vines Zin… but I haven’t discovered anything amazing recently so I figured I ought to just talk about a couple I’ve had recently. My sister-in-law and her husband have been visiting recently, so it’s been easier to quickly try a few wines… alas, none have been great. 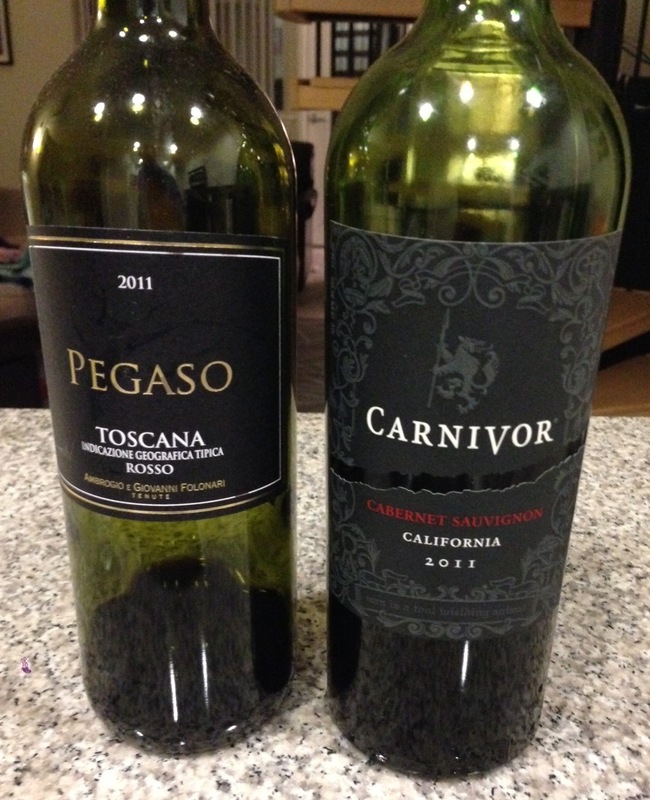 I got both of these wines, the Carnivor cabernet sauvignon and Pegaso Toscana, during a sale at Bevmo. They might be hard to find at other vendors. I also got the Pegaso Toscana Rosso on sale at Bevmo. While I don’t remember the exact price, it doesn’t really matter since I won’t be getting it again. This is an example of an blah food wine that goes really bland on it’s own (yes, I like to have a glass while I’m cooking before I eat…) On it’s own it didn’t really have any particular flavor that I can point out. I had it with a nice bison bolognese, and it seemed to develop a little spirit, adding a bit of fruit and a finish. But still, not a great wine. Hopefully I’ll come across something great soon!